Canon PowerShot SX10 IS macro and telephoto versus G series. Super Macro mode can shoot objects that are zero distance from the lens! You cannot get any closer than that! Macro is this camera’s strength. Its weakness is most likely at the telephoto end, such as difficulty focusing on and shooting at moving birds (a problem any compact camera will have). It could still be a good compromise for shooting birds, half the size and weight and much cheaper than a DSLR style camera. A tripod would be helpful for sharper shots at telephoto. At all zoom settings, I recommend setting ISO at 400 or lower to avoid noise (blotchiness at the detail level at ISO 800 or higher), unless you need to hand hold the shot. By default the camera uses Auto ISO, which might do okay in most of your daytime outdoor shots. The SX10IS is 1.5 pounds (large and bulky compared to the G9 or G10), surprisingly wide 20x zoom range, 28-560mm equivalent lens, probably decent quality, with good Image Stabilization (IS), a must-have in any camera. Its sensor is unfortunately quite small, 1/2.3 ” (6.16 x 4.62 mm), which limits the size of your prints, or low light shooting abilities, compared to cameras which have larger sensors such as the Canon Powershot G9 or G10 (which cost $100 more). If your goal is mainly prints smaller than 10 inches, then the SX10IS should be fine. Larger prints with it are possible if you shoot steadily and carefully, within its limitations. You might also look at the Fujifilm Finepix S100FS (34 ounces; 28-400mm lens), which will take higher quality images if you shoot RAW mode, but is somewhat larger and heavier than the SX10IS. Your needs may differ from mine. Personally, I need good enough quality to sell and publish large landscape prints, and I would pick a Canon Powershot G9, G10, G10, G12, or pocket sized S95 for fun, smaller carry-everywhere size, combined with great quality images (better image quality than SX10IS) and good macro. However, the telephoto is nowhere near as long in the G series versus SX10IS, so cropping images could compensate to similar ballpark quality. A birder hobbyist shooting mostly in bright daylight or sunlight may prefer SX10IS for the long telephoto. 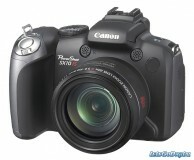 What are your views on Canon G3X ? In the past, I’ve really enjoyed the high quality and ease of using Canon PowerShot compact cameras (models S95, G9, SD700IS, Pro1, ELPH SD500, and G5; released from 2010 back to 2003). But as of 2015, the Canon G3X is generally beaten by the competing Panasonic FZ1000. I admit that, when compared to Panasonic FZ1000, the Canon G3X (2015, 26 oz, $1000 + $240 viewfinder) has some good advantages including a touchscreen, longer zoom range (24-600mm equivalent) and significantly smaller body. — FZ1000 has significantly faster autofocus speed (less shutter lag), and longer battery life (360 shots per charge versus 300, CIPA). G3X has inferior continuous shooting performance (especially shooting RAW). — FZ1000 tilts and swivels its LCD (articulates), but G3X just tilts. — Compared to Panasonic FZ1000 and Sony RX10, RAW file dynamic range for G3X is a stop or two worse at ISO 800 and higher, and its sensor is a bit noisier. — At wide angle, when shooting RAW, G3X’s resolution equals the sharpness of Panasonic FZ1000 and Sony RX10 version I; but the latter cameras shoot sharper JPEGs. — If you are looking for excellent video, the Sony RX10 II is best, followed by Panasonic FZ1000; whereas the G3X lacks 4K video. Sony A6000 (12 oz body, ~$630 at B&H) mounted with a Sony 18-200mm lens (27-300mm equivalent, 19 oz, model SEL18200, $800). The A6000’s 24-megapixel APS-C sensor has 3 times the light-gathering surface area of the 1-inch-type 20-mp sensors found in G3X and FZ1000. Images from A6000’s 27-300mm equivalent lens can be cropped to approximate telephoto quality from the smaller-sensor G3X and FZ1000 cameras.